Veronica is an unusual vampire. 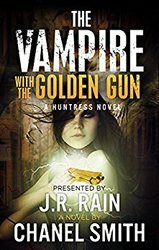 She’s a huntress who dedicates herself to ridding the California coast of rogue, evil, and inhumane vampires and other supernaturals. However, she also hunts humans—the evil ones, anyway. Rand is a vampire hunter who needs to avoid Samantha Moon for a while after he shot her in the shoulder with a silver bolt—Sam banished him from California by dumping him on a cruise ship. When Veronica and Rand cross paths on the cruise ship, there should have been animosity, even bloodshed. However, they are flip sides of the same coin and they develop a connection—and a wild physical attraction. After all, they’re both determined to rid the world of the same evils. And, they both have needs. Two-thousand-year-old vampire Julia Augusta Agrippina is rich and powerful—and she’s tracking Veronica. When Agrippina sends Veronica to New Orleans with a golden gun, her quarry is a dangerous, ancient demon. Rand says he’s going to Atlanta after a supernatural serial killer. Will Veronica and Rand survive their entity-slaying gigs? Will they ever see each other again?